Put Yourself to Bedlam: Sold! To The Highest Bidder! Tonight, I participated in my first official art auction, both as an artist, and as a bidder. The auction was organized by Arts Alive! and despite not being able to locate any info in the usual advertising venues, I was pleasantly surprised to find hundreds of people in attendance when I arrived. The last event, First Fifty, in which I put a large mixed media piece priced at $1,200, did not get the kind of exposure I'd hoped for, and so this round, I put a very small piece in the show in response to the warning on the application that, "because this is the first Arts Alive auction, we're not sure how much people will be willing to spend, so offering work in the $100 and under range is wise, unless you're ok with it not selling." Plus there was an additional fee for adding a reserve. 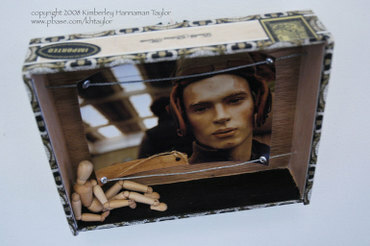 Following their advice, I entered a small mixed media piece, that is essentially a miniature version of the last show's piece Dead To Rights, but this time it is just one picture of a soldier mannequin, strung inside a cigar box with an artist's figure model inside. To my horror, my piece went up second in a line of over one hundred items, and the first item did not sell. I turned red as a beet as they brought around what looked to me now in this giant venue, a minuscule representation of my work - I may as well have submitted a postage stamp. The auctioneer began the bidding at $15, and it was bid on immediately followed by $20, $25, $30, $35...pause.....$40...$45. "Do I hear $50? We're at $45....going...going SOLD!" To my friend Hillary sitting right next to me. I almost felt sorry for the lovely person (who I could not see) that bid it up and didn't win. Plus, I really didn't expect it to sell for more than $30 and in the end, relative to some of the huge, beautiful paintings that sold for under $200, I made out like a bandit. I couldn't believe some of the pieces that sold for so little last night. Even with no money to spare, I bid on a few just because I couldn't stand to let them go unsold for such incredible prices. Good thing I didn't have any money to spare, or tomorrow morning would find me with more art than I could hang on my walls. It was great big fun and a learning experience for next year. I'll have to put something a little bigger and better in, but not worth more than $100.